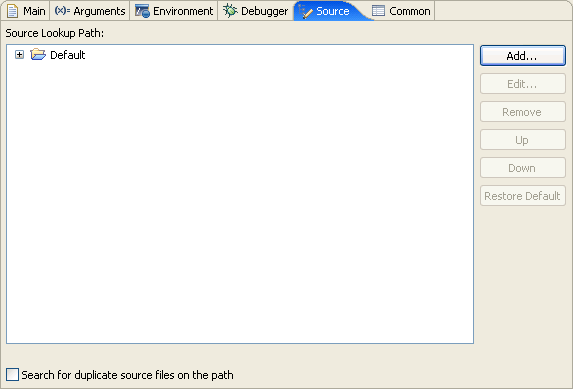 The Source page of the Run and Debug dialog boxes lets you specify the location of source files used when debugging a C or C++ application. By default, this information is taken from the build path of your project. Add Adds new source containers to the Source Lookup Path search list. Edit... Modifies the content of the selected source container. Remove Removes selected items from the Source Lookup Path list. Up Moves selected items up the Source Lookup Path list. Down Moves selected items down the Source Lookup Path list. Restore Default Restores the default source search list. Search for duplicate source files on the path Controls whether to continue search for files with the same name.